Don Q Infusion: Pour the bottle of rum over a coffee filter with 10 gram of coffee powder. After the coffee, let the rum infuse for 5 days in 80 grams of cacao nibs,and a 45 gram raw cacao bar (Albert Heijn). Garnish: Orange zest, Blackberry, Raspberry on a stick with Salami di chocolate on the side. A tribute to history and tradition. Tradition that has made history. Cocchi Barolo Chinato has found its best soulmate. One at its purest form. Raw chocolate. Without hesitation, Barolo Spoke some wonderfull words . 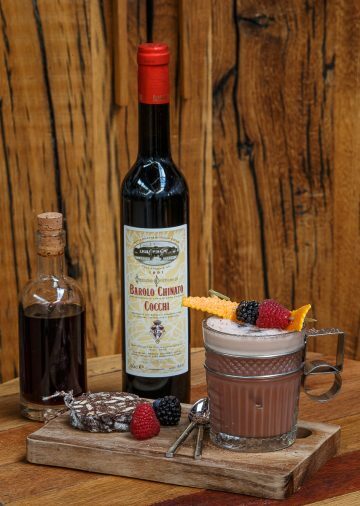 “I, Cocchi Barolo Chinato, take you, Chocolate , to be my wife, to have and to hold from this day forward, for better, for worse, for richer, for poorer, in sickness and health, to love and to cherish. “. And ever since they are not separable. Mr and Mrs Bittersweet. In the honour of keeping family traditions alive. I have made a salami di Chocolate to pair with the Cocchiccino. A recipe of my aunt. The bitterness of the cocktail pairs perfectly with the slightly sweet side of the chocolate.